February 20, 2019 – Immokalee, FL – Taste of Immokalee, a Benefit Corporation committed to providing hands-on business experience to youth desiring to break the cycle of poverty, has been selected as a beneficiary of the Community Bag Program for the months of February and March at the Winn-Dixie store in Immokalee. The Community Bag Program, which launched in January 2019, is a reusable bag program that facilitates community support with the goal to make a difference in the communities shoppers live and work in. 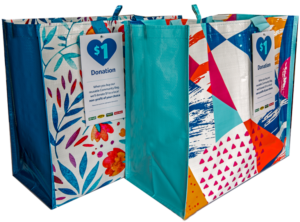 The program features two reusable Community Bags with a special Giving Tag attached to it that allows customers to direct a donation to a non-profit of their choice upon purchase. Taste of Immokalee will benefit from Community Bags purchased at the Winn-Dixie store in Immokalee between February 20 and March 31, 2019. With every reusable bag purchased during this time, Taste of Immokalee will receive a $1 donation, unless otherwise directed by the customer through the Giving Tag attached to the bag. The two colorful reusable Community Bags with the Giving Tag can be found on the reusable bag rack at the store. The key is to look for the bags with a tag that features a blue heart with $1 in it. Taste of Immokalee’s goal is to raise $1,500 through the community bag program, which will enable the company to offer one additional paid internship opportunity to a local high school student. Founded in 2014 by One by One Leadership Foundation, Taste of Immokalee raises up future leaders and provides students with the resources and training needed to be career-ready and successful beyond high school. Learn more about Taste of Immokalee by calling (239) 297-6814 or visiting www.TasteofImmokalee.com. For more information on the Community Bag Program, visit seg.bags4mycause.com.